SAP offers a wide range of knowledge sources to help you find a way forward – be it clarifying a simple question, configuring a complex scenario in your SAP solution, resolving an issue or, receiving/sharing best practices. In line with SAP Product Support’s Strategy, Next Generation Support for the Intelligent Enterprises, these knowledge sources empower you with a plethora of choices to suit your unique needs. In this blog, we outline the various help channels for SAP Business ByDesign (and in fact, these cover almost the whole of SAP’s portfolio). If you aren’t using one or more of these repositories, this blog will help you achieve a quick start. If you are already familiar with the topics below, it should be a good refresher for you. Feel free to share your best practices via comments to this blog. KBAs are typically written to help with a single business process step or when there is a direct correlation of a problem/error to a solution. Since November 2017, KBAs for SAP Business ByDesign are also indexed on google and can be accessed without the need for any special credentials. 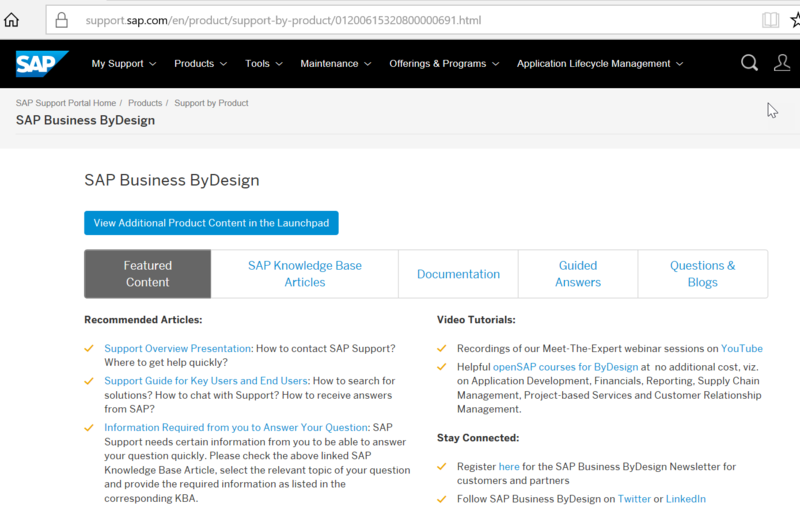 Expert Chat now available for SAP Business ByDesign – click here.